It might not be a household name, but with a panorama spanning some of Europe's most iconic peaks—including Jungfrau, the Eiger, and even the distant Mont Blanc—the Schilthorn summit offers one of Switzerland's most spectacular mountain views. The 9,744-foot (2,970-meter) mountain lies in the Bernese Alps and is famous for its revolving mountaintop restaurant, Piz Gloria, which was featured in the 1969 James Bond movie On Her Majesty's Secret Service. The star attraction of Schilthorn is the view from the 650-foot (200-meter), open-air Thrill Walk observation pathway, but visitors can also dine at the Piz Gloria revolving restaurant, browse the interactive Bond World exhibition and 007 Walk of Fame, and visit the Igloo7 snow igloo. Cable cars run every half hour to and from the summit of Schilthorn. Wrap up warm—the high altitude means it will be chilly on the mountaintop even in summer. The cable car and summit restaurant are wheelchair accessible. A mountaintop gift shop is open to the public. The Schilthorn Mountain is located in the Bernese Alps in central Switzerland, overlooking the Lauterbrunnen Valley in the Bernese Oberland. Access to the summit is via cable car from the village of Mürren, which can be reached by cable car from Stechelberg or Gimmelwald. The closest major resort is Interlaken, from where trains head to Lauterbrunnen and connect with Stechelberg by bus. A Swiss Travel Pass can give you unlimited access to trains and buses. It's also possible to hike to the summit from Mürren, a hike of about five hours along well-marked trails. It's possible to visit Schilthorn all year-round, although the cable cars are closed for maintenance for three weeks in November and one week in April. The most popular times to visit are the summer months of July and August, and the winter holidays during December and January. Visiting outside of these times can mean fewer crowds and lower accommodation and tour prices. The rugged slopes of Schilthorn offer ample opportunities for hiking, and summer visitors can tackle the Mürren via ferrata or go paragliding over Schilthorn and the Lauterbrunnen Valley. In winter , skiing, snowboarding, and sledging are popular pastimes, with highlights including the Skyline Snowpark, the Schilthorn-Engetal piste, and the Diretissima piste—the steepest in the Jungfrau region with a gradient of 88 percent. 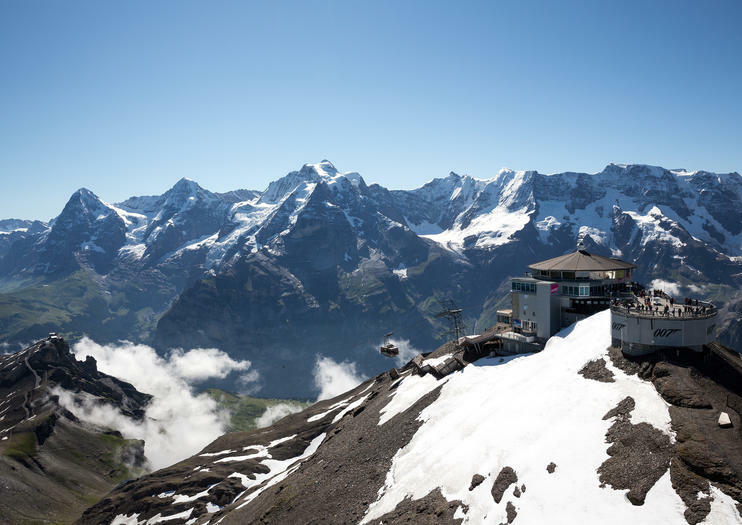 Ascend to the summit of the Schilthorn with a gondola ticket that also includes admission to the mountain’s Thrill Walk, Bond World exhibition, and entry to the 360° Restaurant Piz Gloria — an eatery that rotates as you eat. Use your time at the top to visit the alpine attractions and soak up views of the Eiger, Monch, and Jungfrau peaks. Just show your voucher at the Stechelberg valley station for a relaxing mountain day out. Float high over the Swiss Alps on this 1.5-hour paragliding adventure from Lauterbrunnen. Flying tandem with an experienced pilot, soar over the alpine landscape of the Schilthorn and the Lauterbrunnen U-Valley. No experience is necessary; participants of all abilities are welcome. Hotel pickup and drop-off in Lauterbrunnen is included. Boasting soaring peaks and spectacular mountain scenery, the Bernese Alps attract visitors from across the world—but reaching the remote heights alone is a challenge. On this private tour, explore the pretty Lauterbrunnen Valley with round-trip travel from your Interlaken hotel plus train and cable-car tickets included. Admire panoramic views over Mt. Eiger, visit the traditional village of Mürren, and see the best of the Bernese Alps in one adventurous day. Discover the beauty and tranquility of Switzerland’s Alpine regions by going on a day trip to Interlaken from Geneva. Take the stress out of organizing transport by having a convenient hotel pickup and drop-off included. You’ll travel comfortably between Geneva and Interlaken, and have a driver for roughly nine hours to take you between dispersed sites. Highlights include Schilthorn Cableway, Lake Thun, and the traditional Cog Railway. Explore the soaring Bernese Alps on a full-day, private tour from Bern by train and cable car. You’ll get sweeping views across the mountains from the summit of Schilthorn, challenge yourself to take the vertigo-inducing Thrill Walk from the terrace at Birg, and visit the interactive Bond World 007 exhibit, with the option to purchase lunch in a revolving restaurant set high amid the peaks. Spend a day in the Lauterbrunnen valley and in the middle of the Bernese Alps. Visit on a spectacular roundtrip by train, cable car and railway the area of Lauterbrunnen, Mürren and Schilthorn. Toghether with your private tourguide, you will discover the summit and enjoy the fantastic aerial view which spans from the Titlis, Jungfrau, Mönch, Eiger, over the Bernese Alps and the Jura mountains up to the Vosges Mountains and the Black Forest. Mont Blanc is also just visible.Stay relaxed at the panoramic revolving restaurant at the summit, Piz Gloria, was featured in the 1969 James Bond movie On Her Majesty's Secret Service. Visit the exhibition about the movie and get nervous, when passing the "James Bond thrill walk" on the way to the summit. Take a break from the bustling streets of Basel and enjoy an unforgettable day in the Bernese Alps with a private tour of the Lauterbrunnen Valley. Visit the summit of Schlithorn, famous for its with its panoramic revolving restaurant featured in the 1969 James Bond movie On Her Majesty's Secret Service. Enjoy a James Bond movie exhibition and experience the "James Bond thrill walk" on the summit, while also taking in fantastic panoramas of the Swiss Alps. An unforgettable journey at the top of Schilthorn!.At 2970 m, enjoy the spectacular view, over 200 peaks and the famous Jungfrau, Monch and Eiger peaks listed as UNESCO World Heritage Sites.Follow in the footsteps of James Bond with the interactive exhibition! Relive the mythical scenes of the movie "At His Majesty's Secret Service".The Skyline Walk is a gateway that offers you thrills! It overlooks a vertical wall and offers a panoramic view under your feet! Continue your visit with the thrill walk and walk 200 cliffs on suspended footbridge an adventure full of sensation in the middle of a unique landscape waiting for you! Take a break at the restaurant which turns on itself to offer you a spectacular 360 * view.Go back to catch the bus to discover the biggest underground waterfalls in Europe(if option selected)! An incredible spectacle awaits you, the swirling waters form 10 splendid falls.Then enjoy a free time in Interlaken. An unforgettable journey through the Alps at the top of Schilthorn! At 2970 m, enjoy the spectacular view, over 200 peaks and the famous Jungfrau, Monch and Eiger peaks listed as UNESCO World Heritage Sites.Follow in the footsteps of James Bond with the interactive exhibition! Relive the mythical scenes of the movie "At His Majesty's Secret Service".The Skyline Walk is a gateway that offers you thrills! It overlooks a vertical wall and offers a panoramic view under your feet! Continue your visit with the thrill walk and walk 200 cliffs on suspended footbridge an adventure full of sensation in the middle of a unique landscape waiting for you! Take a break at the restaurant which turns on itself to offer you a spectacular 360 * view.If option selected: Go back down to catch the bus to discover the biggest underground waterfalls in Europe! An incredible spectacle awaits you, the swirling waters form 10 splendid falls.Then enjoy a free time in Interlaken before your return.